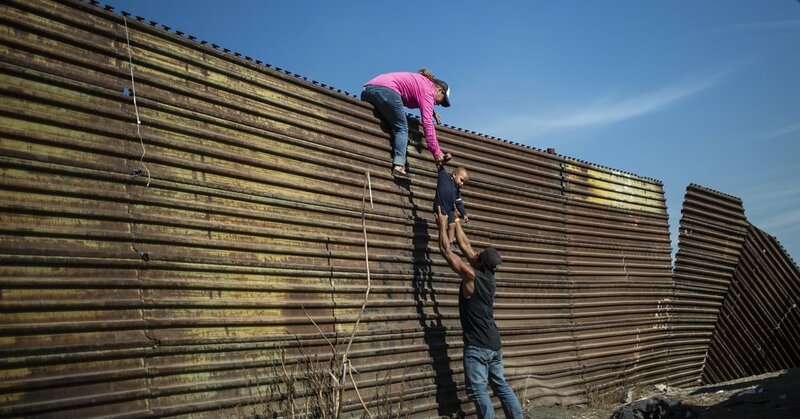 WASHINGTON — The Supreme Court refused on Friday to allow the Trump administration to immediately enforce its new policy of denying asylum to migrants who illegally cross the Mexican border. The Supreme Court’s two-sentence order revealed a new dynamic at the court, with Chief Justice John G. Roberts Jr. joining the four-member liberal wing in refusing to immediately reinstate the administration’s asylum policy. The chief justice, appointed to the court by President George W. Bush in 2005, is now plainly at the court’s ideological center, a spot that had long belonged to Justice Anthony M. Kennedy, who retired in July and was replaced in October by Justice Brett M. Kavanaugh. The court’s ruling thwarted, at least for now, President Trump’s proclamation last month that only migrants who arrived in the United States legally or applied at a port of entry would be eligible for asylum. And it is likely to only heighten tensions between Chief Justice Roberts and Mr. Trump, for whom limiting immigration is a central concern and who has been quick to criticize judges who rule against his immigration programs. After a lower court blocked the new asylum rules last month, Mr. Trump dismissed the ruling as the work of an “Obama judge,” a reference to Judge Jon S. Tigar of the United States District Court in San Francisco, who issued the ruling blocking the program. Chief Justice Roberts issued a statement a few days later rebuking Mr. Trump. After issuing a temporary restraining order blocking the initiative nationwide, Judge Tigar entered a preliminary injunction this week to the same effect. Steven Stafford, a Justice Department spokesman, said the administration would continue to defend the policy. The policy at issue in the case is one of a handful of efforts by the Trump administration to shrink the asylum system — by both discouraging people from applying, and by placing higher burdens on those who choose to proceed anyway. Immigration officials have restricted the number of people who can apply for the status each day at ports of entry while also trying to rule out the possibility of requesting the status at any other location. “If they can execute on both sides of that strategy, that means there are no asylum protections at all,” said Omar Jadwat, a lawyer with the American Civil Liberties Union. Taken together, the result of the changes has been a buildup along the border of waiting migrants, whose chances of gaining refuge in the United States appear more slim with the introduction of each new policy. On Thursday, the Department of Homeland Security announced another blow to the migrants — an initiative that would require them to wait in Mexico throughout the duration of asylum cases, which can take years to complete. Judge Tigar’s ruling was one of an extraordinary series of losses for the Trump administration in the lower courts in cases on subjects as varied as transgender rights, protections for young immigrants, whether Mr. Trump is unlawfully profiting from his office and whether a question on citizenship may be added to the next census. A divided three-judge panel of the United States Court of Appeals for the Ninth Circuit, in San Francisco, refused to stay Judge Tigar’s earlier order. The majority opinion was written by Judge Jay S. Bybee, who was appointed by President George W. Bush. The administration has frequently asked the Supreme Court to intercede in such cases, but it has met with very limited success. Earlier requests for stays were rejected over the dissents of two or three of the court’s conservative members — Justices Clarence Thomas, Samuel A. Alito and Neil M. Gorsuch. The court’s newest member, Justice Kavanaugh, did not note a dissent in any of those cases, suggesting that he was following Chief Justice Roberts’s lead. That changed on Friday, casting the new dynamic at the court into sharp relief. The Supreme Court’s brief order gave no reasons, as is typical in rulings on stay requests. The case is at a preliminary stage, and it will move forward in the lower courts. The next step is for the Ninth Circuit to hear the administration’s appeal of Judge Tigar’s preliminary injunction. If the appeals court affirms it, Judge Tigar would ordinarily conduct further proceedings on whether to make the injunction permanent. Lee Gelernt, a lawyer with the A.C.L.U., which represents groups challenging the new asylum policy along with the Center for Constitutional Rights and the Southern Poverty Law Center, said he welcomed the court’s action. In blocking the administration’s new asylum policy, lower courts ruled that a federal law plainly allowed asylum applications from people who had entered the country unlawfully. That language makes the case an easy one, said Stephen Legomsky, a law professor at Washington University in St. Louis and the former chief counsel for Citizenship and Immigration Services. In urging the Supreme Court to issue a stay of Judge Tigar’s ruling, the Trump administration said the president was authorized to address border security by imposing the new policy. “The United States has experienced a surge in the number of aliens who enter the country unlawfully from Mexico and, if apprehended, claim asylum and remain in the country while the claim is adjudicated, with little prospect of actually being granted that discretionary relief,” Solicitor General Noel J. Francisco told the justices. “The president, finding that this development encourages dangerous and illegal border crossings and undermines the integrity of the nation’s borders, determined that a temporary suspension of entry by aliens who fail to present themselves for inspection at a port of entry along the southern border is in the nation’s interest,” Mr. Francisco wrote. The challengers said that Congress had made a different determination, one that only Congress can alter.